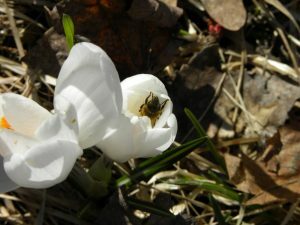 I began keeping bees in 2005. This was before Colony Collapse Disorder and the huge increase in public awareness about the plight of pollinators. However, there was trouble in the hives long before CCD. Honeybees and their keepers have been declining since the end of World War Two. In the US, we have half the number of managed hives than we did in 1945. When that war ended, rather than shut down factories making explosives and other chemicals of war, we just changed their focus to making pesticides, herbicides and fertilizers – a war on the land, really. US farming practices changed in many ways at that time, moving to monocropping and chemicals and le aving behind cover crops, diversity, hedgerows, and natural fertilizers. Those chemicals hurt pollinators, while all the practices we left behind helped them. Applying permaculture ethics and principles to our whole food system would turn things around for pollinators, as well as healing our soil, helping climate issues, making people healthier, and much more. While we work on that level of larger scale change, what’s a beekeeper to do? In my over ten years of keeping bees, I have managed to remain chemical-free. I know – these labels are confusing. Do I mean organic or treatment-free or “IPM”? Let me just tell you what I do – I don’t use medications (antibiotics, miticides, or essential oils). I do use powdered sugar, screened bottom boards, drone frame removal and I do feed sugar syrup if my bees will starve without it. Most importantly to staying chemical-free, I use northern bred bees, particularly Russians if I can get them. Does this work? Often it does. I don’t have 100% overwintering success, but I don’t know anyone who has that, no matter what they use or do. I’ve had a pretty small apiary, thus a pretty small sample size which is hard to extrapolate a lot from – I’m actually growing my apiary so that I can get clarity about how well this really is working. 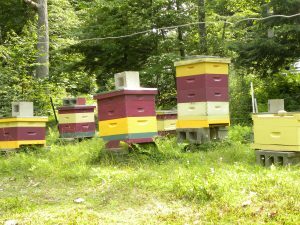 But I definitely have hives overwinter every year, and harvest honey most years. In the 2015-2016 winter I went in with 4 full hives and 5 nucleus hives and came out with 4 full hives and 3 of the nucleus hives, which I’m happy with. I’m still refining my program, so I hope it will get better and clarify what is and isn’t working, and I’ll be sharing that info on this site’s blog. Why am I trying to do it this way? 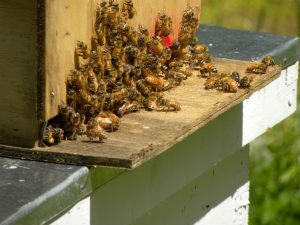 Using chemicals in my hives does not fee l like a sustainable solution to the problems bees face. 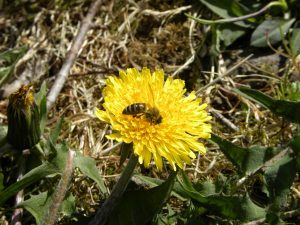 I am looking for the balance between being hands off enough to let the bees evolve to deal with the diseases and pests they face, while keeping enough alive to actually do that. I don’t know if I’m getting it right, but that’s what I’m going for. I do think that generally in our society people want to reach for fast solutions and chemical controls that we end up regretting later on. So I am resisting that, leaning on permaculture principle 9: Use Small and Slow Solutions (slow and steady wins the race!) and offering the bees some support while we work to address some of the larger problems that can’t be fixed just in our own backyards.